Facebook is an open place where anyone can connect with you. Although, it was developed to connect with the people who you know in your real life like your friends and family members but now people are using it for their business purpose also to be in touch with their customers and followers. Facebook is now mature enough to detect spam activities. If you'll send friend requests to unknown people, your account may be blocked temporarily or permanently, leaving behind the sadness on your face. You may find hundreds of tutorials on Google claiming to give you 5000+ friend requests in one day or week but sadly, nothing will work. Moreover, if you'll try those tricks, Facebook may penalize your account for spam protection. Instead of this, it would be better if you'll try some ethical ways to gain more friend requests. This may not give you instant results but at last, you don't have to lose anything. Also, It's good to target people who actually care about you and your work instead of targeting those who know nothing about you. Here are few things you can do to gain lots of friend requests on Facebook in ethical way. If you own a website or blog, you can link it with your Facebook profile. If you're getting decent traffic, this method will perform very well. Either you can directly add your profile link in an anchor text or you can use Facebook follow plugin (which is particularly to get followers). I recommend using them on about/contact page and below post content in "about the author" section. If your readers will find interest in your articles, they will look for the way to connect with you and Facebook is undoubtedly the best medium. Make sure to add a call to action note while linking to your Facebook profile. For example, you can write "add me on Facebook", "Connect with me" or "Follow me" in the anchor text. These call to actions will drive more people to your profile and thus, you'll get more friend requests. Good thing about Facebook is that, it index profiles in search engines as like pages are indexed. Out of all search engines, Google has a great potential to drive huge traffic. Each time, when someone search for person's name on Google, it will first show the social media results. In the same way, there may be thousands of people searching your name on Google. Tell me how it would be if all of them will visit your Facebook profile. Around 70% will send you a friend request. This trick is good for those people who have a good reputation and fame in this virtual world. For example, if you own a popular website or if you're a comedian, people will search your name on Google to find your Facebook profile. Make sure that it's there in first result page to get maximum friend requests. Now if you want to find out the current status of your profile, first open Google homepage and search for your first and last name and add "Facebook" keyword after it. Alternatively, you can search your profile link. If your profile is there on first, second or third results page, this means that it's already indexed. On the other hand, if you didn't find it, you've to index your Facebook profile manually. First of all, login to your Facebook account and click the drop-down arrow icon at the top-right corner of the page (same button from where you logout the account). Now click "Settings" option from the menu list and move to "Privacy" tab. Now under "Who can contact me?" section, make sure that "Who can send you friend requests?" option is set to "Everyone". From the same page, you can change the visibility privacy for the people who you want to see your profile in Facebook search when they'll search your mobile number or email address. Make sure that they are also set to "Everyone". Remember that, the more people your profile will reach, the more friend requests you'll get. You just have to keep few little things in your mind. Always upload good quality pictures (DSLR photos), fill your about section completely, clean up your Facebook timeline, get custom username and don't share useless posts. For more tips, you can read my previous article on how to make professional Facebook profile. If you've a huge fan base on other social sites like on Twitter, Instagram and Google+, you can link your Facebook profile with them so that other people who are not friend with you can send you friend requests. Make sure to add your profile link or username in about section. You can also add it in photo caption and comment. Apart from this, create a professional looking cover photo and add all your social profile links in it as like most of the celebrities do. 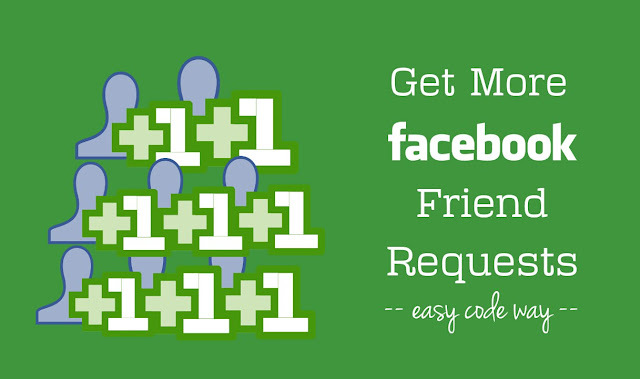 This trick is evergreen and it can drive huge friend requests in a very short period of time. There are hundreds of "add me" groups on Facebook where people add each other. Simply search them on Facebook and join up to 10 groups with more than 20k+ members. Now wait until your join request is approved by admin and then post a status on all groups with a note as "Add me". You can also post on multiple Facebook groups at once. Do this for few days and you'll start getting new friend requests instantly. Tip: No doubt, females get more friend requests as compared to the males. If you're using your duplicate account, you can change its gender to female and upload some cute girl photos. You'll definitely find some boost up in your friend requests. It's too easy to fool dumb people now a days. Haha. Here are few important things which you should keep in mind while using above tricks. Don't post in groups too frequently: If you're using "Add me" groups to get more friend requests, you've to be very careful. Remember that, don't post too frequently otherwise, Facebook may block your account or its particular service temporarily or permanently. Don't use automated bots: You may find hundreds of third-party websites or apps claiming to give you 5000+ friend requests in a very short period of time. Speaking frankly, nothing will work. Such automated bots are useless and they may use your account for spam purpose or hack you. And most importantly, Facebook is also strict against such spam activities. Don't send friend requests to unknown people: It's good to receive friend requests from other people than sending requests by yourself. Facebook aim is to connect with the people who you know in your real life. If you'll send friend requests to unknown people, your account will be marked spam and fake. Don't accept friend requests too frequently: In the same way, don't accept too many friend requests from unknown people. Always keep a little time period gap between your each activity so that Facebook will treat you as a real person. Some of the people reading this article may be thinking that what are the benefits of getting more friends on Facebook. I guess! Well here are few examples for you. Increase post likes: Your social media and personal life should be parallel to each other. If you've more friend on Facebook, you'll automatically get more likes on your posts indirectly. And everyone knows that people use Facebook likes as a mean to measure person's reputation and fame. This is the saddest truth of today's social life. Increase followers: Believe me or not but you can convert your friend requests into followers. I had already discussed about this topic in my previous article. You just need to enable follow option for your profile and after that, when someone will send a new friend request, he/she will automatically start following you. All these likes and followers give a professional touch to Facebook profile and thus it's very important to get more friend requests. So what are you waiting for? Go and start implementing these tricks. Don't forget to ask your problems in below comment box. Did I had missed something? Great Article! But it takes too much time To get more followers,likes etc quickly that's why i went for paid ones and i will say Sometimes buying followers,like,views worked for me and i do buy followers,likes,views from SMMSUMO Website and its awesome and this site provides me real Human Likes,followers and views with 2 years of service protection and they provide 24*7 support if the buyer face any problem but i didn't faced any problem yet and all my posts now shows on the top of search.This site helped me a lot to grow all my social media profiles. if you need to know more about this then you can ask me here i will surely help you.Search SMMSUMO on google.